I have been wanting to try to make a new Asian dish but wasn't sure what I wanted to try to conquer next. I was browsing our local Chinese restaurant take-out menu and my eyes landed on sesame chicken. As Gru would say..."light bulb!" I decided then that was what I was going to try making for dinner. I was a bit nervous, as I always am, when I'm making a new dish because I always am afraid that it will just taste like soy sauce. Which I do not enjoy. At all. This had a great flavor to it! I added some honey as the sweetener, as well as some sugar and my hubs approved! Since I like everything with a bit of a kick to it - I did sprinkle some red pepper flakes over mine before eating it. Yum. Just absolutely tasty. Coat the chicken pieces in the beaten eggs, 3 tablespoons cornstarch, salt and pepper. Heat a wok or large skillet, add the oil when pan is hot. Add the chicken, browning one side. Flip the chicken over and brown the other side. 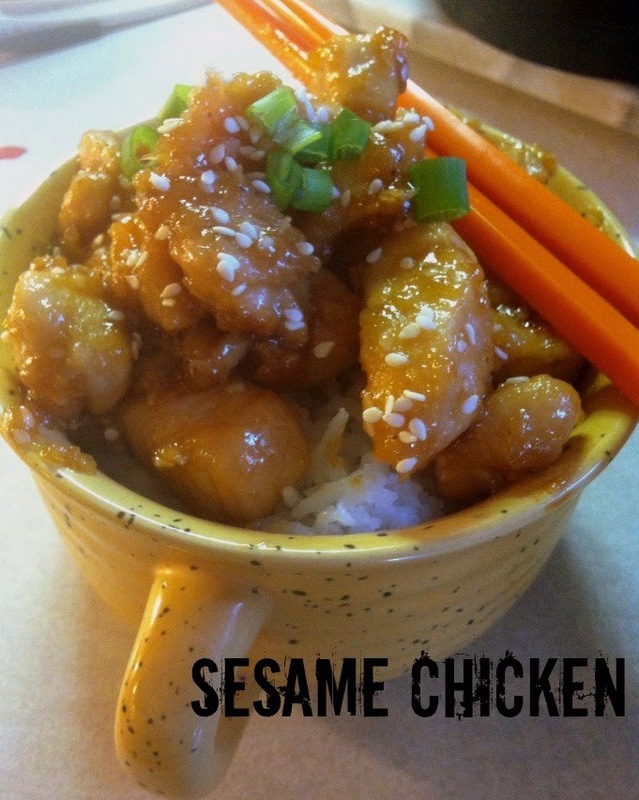 While chicken is cooking, in a small bowl combine together the honey, sesame oil, sugars, soy sauce and ginger. When the chicken is cooked through add the honey sauce and coat each piece well. Add the tablespoon of water and cornstarch, mix well. Top chicken with sesame seeds.